... and Why I’m Making a Website about Compost. My name is Leslie. I’m known in some circles as Joey’s mom which is my real full time job. Today that means we’re studying science for a grade seven final exam. We live with my Mom who is 80, in the small town of High River just south of Calgary, Alberta. We are nestled in the foothills of the Canadian Rockies and, yes, it is beautiful. Joey and I have a happy life full of adventures. 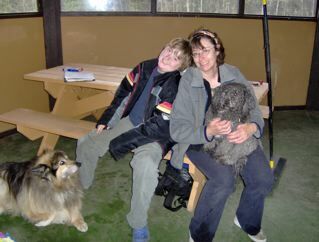 This picture is us on a camping trip with our old dog Muffin (who sadly died in January) and our new dog Pogo. As usual it snowed, and we of course were the only family in a tent. So here we are escaping from the snow in the picnic shelter. My first garden experience remains a vivid nightmare. I would have been about 6 or 7. My job was to weed under the lilac bushes in our backyard. It was completely inundated with chickweed. To get at the stuff I had to crawl right into the maze of lilac suckers. It was there that I found the witch’s bread - a plastic bag with a completely green, moldy loaf of bread inside. I was terrified. I was sure someone was trying to poison me and my sisters. We launched a small detective agency to look into it but found no criminals. It’s ironic, to say the least that I should find myself writing about the wonders of compost all these years later. Plus I've gained a huge appreciation for molds of many kinds. The thing is we didn’t compost in my family. We tossed everything out. My grandparents did compost though. When we went up to Prince Albert, Saskatchewan to visit them I briefly saw a compost pile. It actually seemed strange to me to save all the vegetable trimmings and toss them on what looked like garbage dump in their yard. I thought they were very messy but very cool. My Nana was a big fan of the Farmer’s Almanac. She religiously followed their planting by the moon guides and always had a row of tomatoes in various stages of ripeness lining her window sills. I went to university and got a degree in Environmental Studies. Right away I was hired to work for Parks Canada here in the Western end of the country. I had a great time working for Parks - and spent literally months in back country walking the trails, and taking notes on the plants, animals and soils I encountered. It surprised even me - but that nervous breakdown was more of a breakthrough. It lead me to West Coast where gardening is more likely and to some of I must say my best work. I started Strathcona Community Garden - not by myself - with a lot of other people - but in the very beginning it was just me. It’s now a three acre community garden complete with a wetland wild area, about a hundred allotments and an orchard where over 100 varieties of heritage apples are grown. It exists in the Downtown Eastside area of Vancouver and is a beautiful testament to human and nature partnerships. I also started a small seed company - Manhattan Farms, which I ran for almost 20 years. It’s, I’m very glad to say, still in business. I sold it a few years ago to Suzanne and her husband Robert. Sadly Suzanne passed away a couple of years ago now. Robert continues to operate out in Vernon BC. We have a few big health challenges. Joey has a complicated breathing problem. It means lots of doctors appointments in the big city. About ten years ago I discovered the name for my challenge. I was running myself ragged as the owner and only teacher for an art school. I’d had tingling hands for several years. Doctors actually told me the symptoms I described were impossible. I started having some trouble walking. I was limping and climbing the stairs to the studio where my art school was located was tough. And I was finding it hard to hit my guide dots. You might wonder what the heck a guide dot is? When I did a demo for my students I’d often tell them to put a small dot at the place where they wanted their line to end and then to just aim for the dot as they drew their line. When I tried to do it myself I kept missing the dot - by a lot - like six or seven inches. It was like I had lost control of my hands. Things got worse. I could barely walk and other unmentionable things shut down. I wound up in the hospital. It was remarkably restful. I just stopped trying to get or keep things going and got a lot of tests done. It turned out I had multiple sclerosis. Yikes! And I had to call 40 families worth of students to cancel classes and eventually close the art school down. The treatment for an MS attack the scale of which I had is high doses of the steroid Prednisone. It has the fortunate side effect of making you feel euphoric, invincible. So, despite my diagnosis, I was in a ludicrously optimistic state of mind. 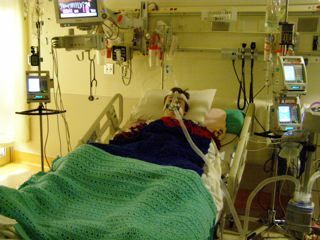 I remember watching an episode of Oprah while in the hospital. In it several people were on the show talking about turning points in their lives. They were all people who’d suddenly become very successful or wealthy. I remember thinking - hey I’m at a turning point too. A turning point from independent business owner to unemployed and likely unemployable bag lady. Remarkably, thanks to the steroids this didn’t bother me at all. I figured I’d get a gig writing a column for O magazine and live happily ever after. Joe and I thanks to family and friends and Canada Pension’s disability have been okay. But - as a pair of adventurers okay is not necessarily okay. Or is only okay for so long. Or only okay until your 1984 Honda Civic dies. And you need a new car - to get to the hospital on a regular basis. Realistically my skills are thinking and writing. I can also type but now only with two fingers at a breakneck speed of 28 words a minute. On a good day I think I could work for about four hours. I can’t walk very well, I can’t stand for any length of time, and I need time off for medical appointments. Plus I love vacations. Ideally I’d like all school holidays off - and then some. Well... I discovered it takes a lot of work to get those jobs. First you have to write a pitch. And the pitch has to be well researched and perky or clever in just the right way. And pretty much to keep yourself writing you have to make up a couple or three of these pitches every single day. Most fail at least at first, and those that produce a nibble often want something quite different from what you've already spent a good bit of time researching. One particularly bad day I decided to weed through all the sites I'd bookmarked. I found this page I’d named “Build Web site”. It led me to Solo Build It. Do you ever find yourself with a nagging little question. Mine was this - Why would anyone spend a bunch of time setting up and running a website? Why do people work for hours on their websites? What are they getting out of it? It never even occurred to me that they might be earning a living. So... now I’m building a website - on a subject I’m finding incredibly fascinating. I get to go into as much detail as I want about what I’m finding so interesting. And I get to write about it in my voice - not in the voice of a particular magazine. I’m learning big time. Plus I’m learning how to build and manage my own website. I post my own pages. If I put one up and read it over a find myself cringing, I just edit it and put up the new improved version a minute or two later. How great is that? It's very great! And very empowering. It lets me be part of the world again. With compost you build an ever renewing resource - something that just keeps on paying you with better soil fertility and better crops. It's all thanks to the resulting relentless crew of billions of soil organisms. So why garden the old way when you can build an ecosystem and harness the power of the microbes to your garden. Remember that Build Website page I'd bookmarked? Turns out it led me to the perfect solution for my "Work Problem". I'm now using Solo Build It to build and manage my website. I first spent about a week reading all these case studies they have on their website. Check out the stories these people have to tell. I found myself first wondering, then thinking maybe and then believing that I could build a website business too. Solo Build It, aka SBI is not unlike that finished compost. SBI says Why build a website when you can build a business? And for me anyway that makes total sense. SBI is my partner, and they work 24/7 pinging, and taking care of all the technical aspects of making my site all that it can be. They're much like the microbes in the compost. I'd like to invite you to bookmark this page and check back now and again to see how things are progressing on the business front for this website. If you want to get going on your own site right away I don't blame you - I'm personally kicking myself for waiting two years to get back to the page that led me to Solo Build It. Here is a link to the SBI site. It will give you access to many other pages as well as free access to a certain percentage of their amazing tools for website building. And if you decide to try SBI after clicking on the link here I'll earn a commission and both I and Joe will thank you. Find a business that fits you - Share your passion - Have a ton of fun - Make an income. Or you can Contact Me with your questions or comments. If I can answer your questions I will. If not I'll pass them on to someone who can. Once you feel comfortable with the program go for it. SBI will take you by the hand and lead you through the process to build a high traffic website that will work for you. And the sooner you start the process of creating your site the sooner you'll have a site you'll be proud of. Just a warning - this is not a get rich quick scheme - it's a get rich slow and steady scheme. Have a very good time with this - and good luck.